This was our first ballet music, and the first time we appeared with a full 8-person team – this video was taken at the 2007 Lincoln City Fall Festival… Members at that time were John Barresi, Steve de Rooy, Todd Rudolph, Egan Davis, JD Fabich, Justin Redington, Carl Bragiel and David Hathaway. A little night flying fun with John Barresi and Steve de Rooy. 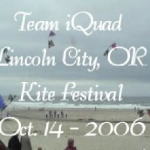 One of our earliest videos, from the Lincoln City Fall Festival in October of 2006. The gang cutting loose at the Uchinada Kite Festival near the end of a long Japan trip, pilots are John Barresi, Steve de Rooy, Mike Kory, Jay Nunes, Bazzer Poulter and David Hathaway.